Online learning has traditionally been about content delivery. With the Next Generation Online Learning classes offered for Denver Seminary’s fully online degrees, that is no longer the case. Original content produced by Denver Seminary faculty still plays an important role. However, engagement drives these courses. Our courses are designed for active learning, student-to-faculty engagement, student-to-student engagement, and student-to-world engagement. Learn more about Next Generation Online Learning, view upcoming courses and technology requirements, review FAQs, and see below for our fully online degree options. 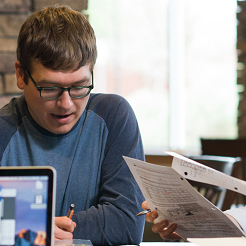 Denver Seminary’s 78-credit-hour MDiv is fully accredited and offered fully online! This academic degree is designed to be completed entirely online and can be completed in just 2 years. The MA in Leadership can be completed residentially at our Denver, Washington DC, or Texas campuses, or online in less than two years. Our MA with the greatest number of open elective hours is now fully online. A twenty-hour theological certificate for those who want to know more about the Christian faith. For more information about these online degree programs, please contact the Admissions Office or call 303.762.6937.